I know many visitors flock to Universal Orlando in the fall for a certain spooky celebration. However I like to skip all the scary stuff and move onto the winter holiday’s. The Macy’s Holiday Parade daily at Universal Studios. This year, you’ll get to see two all-new balloons exclusive to our parade: Turkey Balloonicle, a towering balloon with a self-powered vehicle and Holiday Lights Balloon, a spectacular string of balloons that dazzle while floating through the air. Mannheim Steamroller, the masters of modern Christmas music. 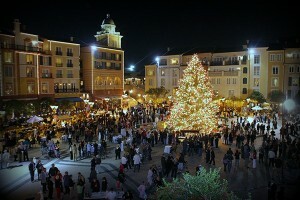 This year, they’ll take the Music Plaza Stage in Universal Studios on Dec. 5, 6, 12, 13, 19 and 20. The celebration continues at Universal Orlando’s four on-site hotels, where you can experience holiday buffets and dining events, tree-lighting ceremonies, special music performances, Hanukkah candle lightings, visits from Santa Claus, holiday poolside “dive-in” movies and family-friendly New Year’s Eve celebrations. Honestly, who wouldn’t want to celebrate at Universal Orlando Resort? Last but not least, don’t miss the New Year’s Eve celebration at Universal’s CityWalk. This massive party includes non-stop entertainment, unique party zones—each with their own entertainment and signature drinks—along with access to six different clubs with live music, unlimited gourmet cuisine, and Orlando’s largest dance floor. This is a separate ticketed event, and will go on-sale later this fall. Are you ready to celebrate the Holiday’s at Universal Orlando Resort?